The ABC Design Cobra Plus is designed and engineered in Germany. This 3 wheel pushchair offers a range of seating positions from 6 months as standard, but for extra versatility and from birth capabilities, can also be used with the additional Cobra Plus Carrycot or Risus 0+ infant car seat which are available separately. Its memory foam seat unit and extra padding keeps little one as comfortable as it does safe. The seat unit is also reversible, which is perfect for when baby is in the full lie back mode. High quality ball bearing wheels and 3 position adjustable suspension make the ride as comfortable as possible. Add to this the luxury, handmade, leather effect handle, accents, labels and bumper bar cover and you have a pushchair that looks perfect for any occasion. Within the Cobra Plus, ABC Design have used their unique expertise to create a genius combination of timeless design and optimal comfort. The 3 large, puncture resistant, ball bearing wheels allow parents maximum manoeuvrability in any space or environment, while the front wheel swivels and locks simply with a quick press on top of the front wheel. Adding three levels of suspension means the Cobra Plus can be adapted for any terrain simply by rotating the suspension unit. Comfort is even further reinforced by the addition of an adjustable handle, offering a multitude of options depending on how the individual user would like to push and steer the Cobra Plus. The handle also features a hand operated parking brake, for simple and effective stopping. After use, the chassis effortlessly folds flat for storage and clips together for easy transportation. Quick release wheels make the Cobra Plus even smaller when it is folded and make fitting it in your car boot even easier. The Cobra Plus seat unit reclines in 3 different positions in addition to full lie back, with a carefully designed backrest to provide the perfect angle to support your child’s back and spine. Ensuring little one's perfect position is further aided by the leg rest which is both height and length adjustable. 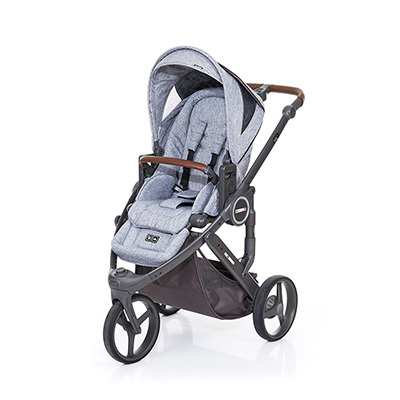 The presence of a luxurious, well padded, memory foam seat liner, shoulder pads and a crotch pad - which also securely covers the harness buckle - all mean ultimate comfort and safety for baby. The unit also features a retractable and removable hood with zip extension which includes a coverable parent viewing window and sun visor which incorporates UPF 50+ sun protection. The padded bumper bar can easily be detached on either side to aid access but stays firmly in place for extra safety when in use. For ultimate protection from the elements, a compact raincover is included which is perfect for quick attachment. The chassis also facilitates the use of the ABC Design Cobra Plus Carrycot or Risus Group 0+ infant car seat effortlessly, or alternatively can use Maxi Cosi, Cybex or BeSafe car seats, which can convert the pushchair seamlessly into a pram or a cutting edge travel system suitable from birth with the relevant car seat adaptors. No matter what seating option you decide to use, the Cobra plus offers parents an endless variety of pushchair options. If you are looking for a 4 wheel option, then look no further than the ABC Design Mamba Plus pushchair, which has the same generous range of features as the Cobra Plus, but comes with a 4 wheeled chassis. To complete your package you can also choose from a wide range of matching accessories including footmuff, changing bag, cup holder, sunny parasol and pushchair gloves.